Wondering why I had not been on the blog for over a week? I was struggling to obey God on a particular instruction like the 30-Day-Man-Fast. 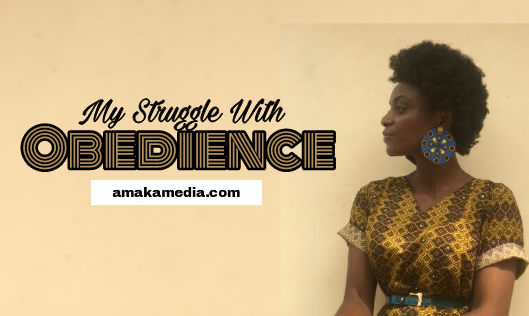 I was struggling so hard that at a point, I even started to think I was under the manipulation of the enemy because I found myself where I'd not ordinarily be. It's been crazy. Writing this article is convicting for me. I try my best to obey what God has called me to do but I'm not always as obedient as I'm called to be. Maybe you're like me in that aspect and you're not as obedient as you'd like to be. Take heart! Oh, I wanted to mention a couple of examples and evidences of how this struggle, in my life especially, is one that I have been dealing with for a long time. But then again, I am led to not share the details (just yet). Obedience is not fun. Sometimes it can be lonely, and other times it can be painful. I just couldn’t seem to find a way to consistently choose Him over myself. I couldn’t seem to be able to live for his affections over those of the world. As hard as I would try in various seasons, I just couldn’t be completely obedient. "Stop right there! If you love me, you will keep my commandments." Like a hammer, it hit me hard. It was active, energetic and powerful. We can't claim to love God and not obey His word. Love is the foundation of genuine obedience to God. If we truly have love in our hearts, we can’t help but be obedient to Him. I long to grow to the place where I am so in love with Jesus that I long to choose Him in every situation. I long to be a servant so in love with my King that I would die for Him or anyone else He asked me to. The word “obedience” is actually a funny word to me though. At the very center of this word is a smaller but more powerful word, "die". ObeDIEdience. At the heart of obedience is dying to ourselves. Perhaps that's what the struggle is all about. Obedience to God requires dying to self and embracing what He has for you. I don't know what it is that you need to die to, but I believe God is calling us unto total obedience. Obedience is laying down our desires, passions, pursuits, and aspirations to pick up the Cross and chase after Him. A love for Jesus brings about a desire to follow the instructions He has set in place for us to follow. I have always said that this is the promised year, but we can't receive the promise without obedience. Obedience releases power, possessions, and purpose. Obedience is required for the next level. "Walk in obedience to all that the LORD your God has commanded you, so that you may live and prosper and prolong your days in the land that you will possess." "Why do you call me, "Lord, Lord, and do not do what I say?" "And this shall come to pass, if ye will diligently obey the voice of the LORD your God." Then you get the Ps. You cannot compensate by sacrifice what you lose through disobedience. No matter how much you try to "donate" to the service of God, if our heart/life is not right it’s just a waste of resources. I want to obey God above everything else. My life—marriage, finance, career, etc—depends on having a heart that lovingly obeys. I challenge you this week: Identify ways in which you regularly disobey God. Ask Him for forgiveness, and decide to bring that area of your life into submission so that you can love God and others better. Does your life give evidence that you love God? In what ways? May God give you the grace to love Him so much that obedience becomes easier. Amen.